Over the course of my journey to the Ecuadorian Amazon, I manage to shed the layers of civilization with each transitional form of transportation: first the hectic Quito taxi ride, then the flight that traversed the ecozone extremes, from the snow-capped Andes to the sultry lowland rainforest in a mere 30 minutes. Next, two hours on a brain-jarring gravel road, the same road that accommodates the infamous oil industry’s pipeline. Reaching the river dock, I bid adieu to the last remnants of civilization, as the local Ecuadorians at this Amazonian outpost gather above the muddy river bank to watch us depart. Our motorized canoe boat was loaded with people, belongings and supplies. As we lathered ourselves in mosquito repellent, a distinct citrus aroma arose, intermixing with the humid tropical air that engulfed the region. Once underway, I could sense that around the first riverbend, through a kaleidoscope of green and brown colored shades, the heart of the Amazon awaited. Our serpentine portage through the murky jungle river went deeper and deeper into the rainforest. Soon the journey would become extremely interesting…. Surprising us from higher ground somewhere in the thick tree foliage, Amazon women, easily fifty feet tall, let loose with an arsenal of spears in our immediate direction. Their spears whizzing past our heads, we managed to outmaneuver their unprovoked attacks. Around the next bend, the river narrowed. Enormous tree vines hung down to the river’s edge. Clinging to the vines were dozens of slithering anacondas, dangling precariously close to our heads as we passed. The Dutch children on board were nearly whisked away by the largest of the anacondas, a mere six meters in length. Our swift response with our supplied machetes prevented the children’s abduction. Further down river the air filled with the sounds of a hundred bees or so we initially thought. The buzzing noises were in fact poisonous darts aimed at us by unfriendly natives hidden in the forest. Fortunately their cursed darts missed their intended marks. A brief respite from harm’s way was abruptly interrupted by a boiling frenzy of activity in the waters ahead. The source of the frenzy was a thousand piranha hungrily looking for an afternoon snack. We pulled our hands and toes out of the water, steering through their frenzied madness. They continued to chase us down river, as did an armada of fast moving hungry caimans. Our mantle adversarial tested, we managed to prevail, and after two hours of such Amazon encounters, we finally reached our destination, Cuyabeno Lodge, which rested along the Laguna Grande. Now our adventure would really begin…. The boat journey was actually a very calming, peaceful experience. There were certainly creatures in the tall trees that we encountered. There were four different species of monkeys as well as a blue and yellow macaw, and a toucan flirting about the tree tops. The pervasive jungle fisherman, the kingfisher, guided us down river. Only one small caiman came into view on a sunny river bank and he gave us little notice. To our surprise, the blacken waters of Laguna Grande were safe for swimming, and we swam every day. The piranha meanwhile swam in the shallow, brackish estuaries downstream. Magical experiences happen in that lake as well. A gloriously dramatic sunset cast pink, gold, aquamarine and sienna colors off the developing storm thunderheads and the placid surface water. The rare fresh water pink dolphins were also present for the show. Quietly we watched a mama dolphin and her two babies surface and resurface in the still river waters. After sunset, a group of us staying at the lodge ventured into the now darkened rainforest; nighttime is when the Amazon’s inhabitants really come to life, big and small. We were equipped only with our senses and a flashlight. The stillness was incredible. Point the flashlight…tarantula on a tree…point it again, a small light green frog under a leaf. What were those big eyes that glittered off my beam!? The short return boat ride across the lake was also dramatic as the earlier developing thunderhead let loose with its stinging patter of raindrops, the rain and lake vegetation illuminated by our boat’s searchlight and the distant flashes of lightning. The next night Laguna Grande offered a spiritual portal to the immense twinkling universe above. So clear was the sky and so free from civilization’s lights that every star in the universe shined that night. So close were they that if you stood on the boat’s bow, you could just touch them. Earlier that afternoon, we fished for piranha with fresh chunks of meat as bait in the river’s murky waters. The Amazon’s jungle silences and sounds are spellbinding. The humidity, especially as you walk deeper inland away from the cooling effect of the open waters can be stifling yet no worse than my days living in Florida. 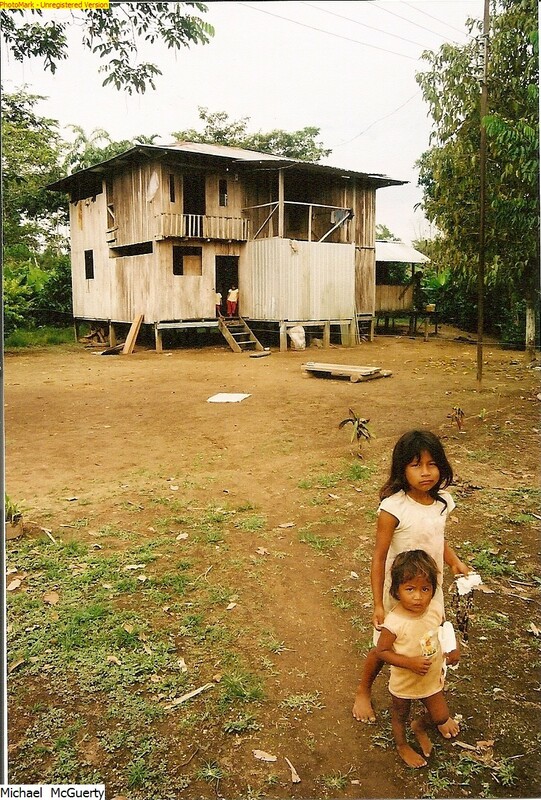 Further down river we visited a small Amazon indigenous Siona community. The days of loin cloths and nose pierced bones were gone here. If you venture deeper into the Ecuadorian Amazon you may still find members of the Huaorani tribe in more traditional appearance. The jaguar and the anaconda are certainly in the jungle, just more elusive than our perceptions of the jungle would lead us to believe. The oil industry in this region has certainly inflicted ecological damage upon the otherwise pristine Amazon jungle. In the ’90s, the Ecuador government applied a tourniquet to the environmental damage hemorrhaging by creating the national park Cuyabeno Reserve, which encompasses Laguna Grande, impeding the oil industry’s encroachment. Ownership of the land was first given to the indigenous tribes in the region, with the assumption the tribe elders would deem priority protection for the land. However, even indigenous man can behave with avaricious intent for some in the community decided to resell the land to the oil industry, slightly defeating the legislation’s original benevolent purpose. So, a political adjustment was made, declaring the land a national park, with the tribes given free lease, not ownership, over the protected land. At my open-air thatched roof hut my only nighttime encroachers were three curious cockroaches while the neighboring monkeys and caimans kept their distance. My bed was equipped with mosquito netting which fortunately was not too tested. I was little bothered by mosquitoes during my stay since the neighboring lake produced an algae which deterred mosquitoes from laying eggs. 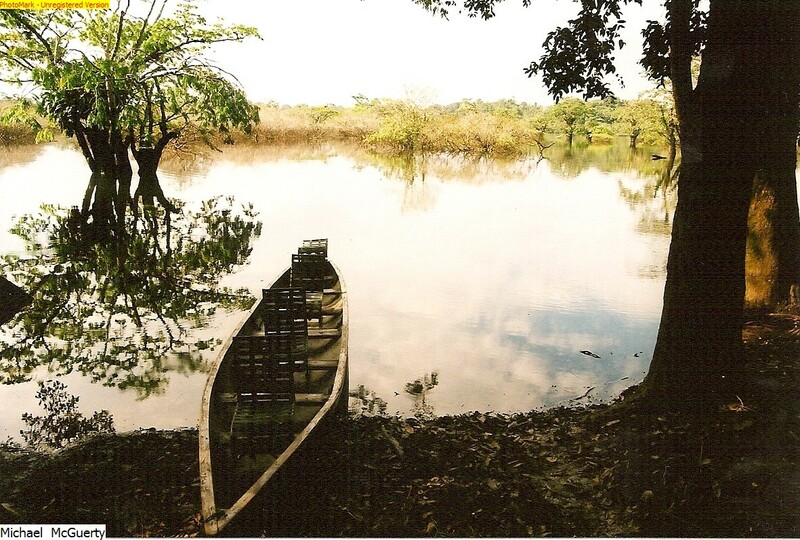 The five days I spent in the Amazon just flowed peacefully, naturally, like the waters and the inhabitants themselves. Returning to the alleged civilized world was difficult. Ouch! Was that a small dart that hit my neck! This entry was posted in S. America travel, Travel and tagged .cuyabeno, adventure, amazon, budget, ecuador, opinion, siona, south america, travel. Bookmark the permalink.